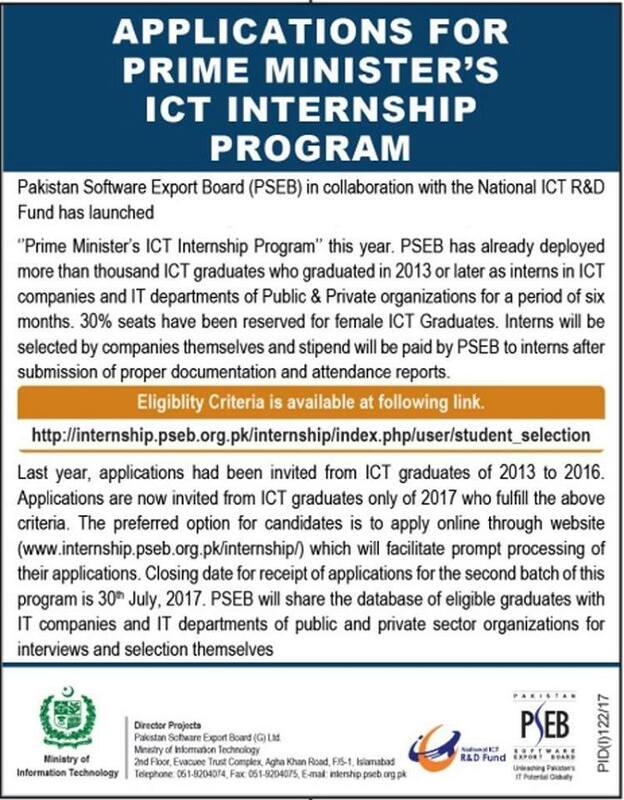 We are hereby glad to inform you that Pakistan Software Export board has announced national ICT Internship Program across the pakistan in various field which are going to dicuss here below.Pakistan Software Export Board in collaboration with the National ICT R&D Fund Company is offering opportunity of internship for the educated youth of Pakistan through Prime Ministers ICT Internship Program to enhance their employability. Students will apply for participation in the internship program through on-line portal at the link given below. Cvs of the students will be shortlisted as per the below criteria and ICT departments from public & private sector organization will be given access to the Cvs of shortlisted candidates for selection as per their demands. Anywhere in Pakistan in following sectors. Last Date to apply for Prime Minister’s ICT Internship Program is 30th July,2017. For Getting more updates regarding internship selection list of candidates keep in touch with us.